Mike Barbero is a former US Army Lieutenant General, who retired from active duty in 2013 after 38 years of service. A career Infantry leader, LTG Barbero served in a wide variety of leadership assignments and has commanded or led forces at every grade, from Lieutenant to Lieutenant General. While a General officer in the US Army, he spent 46 months in Iraq over 3 separate combat tours of duty. He possesses unique experience in leading large and complex organizations, directing combat operations, training forces and working with allies and coalition forces at all levels. He has 4 years of experience in the Middle East coordinating intricate political-military operations, advising senior government leaders and building capacities of foreign security ministries and forces while controlling a $13 Billion Foreign Military Sales program. In his last assignment on active duty, working directly for the Deputy Secretary of Defense, he served as the Director, Joint Improvised Explosive Device Defeat Organization (JIEDDO). Since retirement from the US Army he routinely travels to the Middle East and Europe to develop business and infrastructure projects, meeting with senior political, security, industry and business leaders across these regions. He has testified several times before Congress on security issues in the Middle East and has participated in numerous national and international media programs. He was a contributor to the Atlantic Council’s “Task Force on the Future of Iraq,” and he has participated in numerous fora on business and security issues in the Balkans and the Middle East. 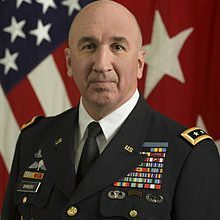 Lieutenant General Barbero holds a Bachelor of Science degree from the United States Military Academy and a Master’s Degree in National Security and Strategic Studies from the National Defense University, Washington, D.C. He is a graduate of the Executive Course in National and International Studies, a part of the National Security Studies Program of George Washington University.